Protestors gathered outside Parliament this morning to protest against prescription charging for people with long-term conditions. Other groups assembled together across England to express their anger by taking part in a simultaneous ‘wake-up phone call' to Number 10. 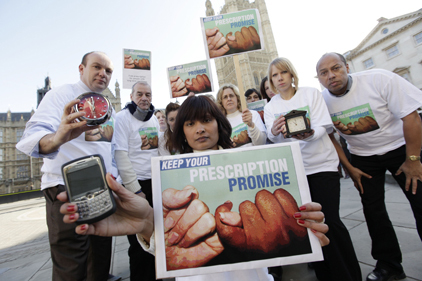 Prescription Charges Coalition is calling on Gordon Brown to legislate on abolishing prescription charges in the next few weeks, to be in with a chance of free prescriptions becoming a reality before the General Election. Gordon Brown promised to deliver free prescriptions for people with long-term conditions at the Labour party conference in September 2008. Prescriptions are already free in Wales and will soon be abolished in Scotland and Northern Ireland. Research by Asthma UK last summer highlighted that a third of people with asthma were finding it harder to pay for their prescriptions since the start of the recession. In 2007, the Citizens Advice Bureau revealed that every year around 800,000 people don't collect their prescriptions because of the cost.